From classical concertos to flamenco rhythms, Renaissance treasures to Modernist masterpieces, Europe offers endless cultural treats for any taste. Here are our top picks for art, music, and theater in the great European capitals and beyond. Italy dominates when it comes to opera and Renaissance art. Florence’s Accademia and Uffizi galleries, plus the Vatican in Rome, are essential stops for art lovers, housing many of the world’s most iconic paintings and sculptures. Classical music and opera are also part of the Italian cultural fabric; from Venice to Naples, live performances showcase the works of Italian maestros like Verdi and Rossini. French museums including the Louvre and Musée D’Orsay exhibit great works from ancient relics to Impressionist delights, while royal palaces like Versailles and Château de Chenonceau display royal art collections to the public. For a taste of Parisian nightlife, go highbrow with a tour of the legendary Opera Garnier, or check out the scantily clad dancers at a classic cabaret. Barcelona is a Modernist showcase, with whimsical designs by architect Antoni Gaudí scattered through the city and a retrospective of Spain’s most famous painter at the Picasso Museum. Visitors can also take a trip to seaside Figueres for a peek inside the mind of Salvador Dalí, and feel the passion of flamenco at an intimate live show in Madrid. London’s British Museum highlights millennia of human history all in one building, boasting cultural treasures like Egyptian mummies, the Rosetta Stone, and original Parthenon sculptures. Across town, a visit to the reconstructed Globe Theater gives Shakespeare fans a sense of the rowdy entertainment scene that surrounded the Bard’s plays in Elizabethan London. The home country of Mozart, Mahler, Schubert, Haydn, and other great composers remains a top spot for classical concerts. Catch a performance at venues throughout Vienna and Salzburg, or add a touch of Habsburg history to the score with a tour of Schönbrunn Palace. Wartime history and modern design converge in Berlin, where Communist relics rest alongside distinctive Bauhaus architecture, and nightlife offerings range from punk rock to chart toppers. For a peek into Germany’s past, enjoy an evening worthy of Frederick the Great with dinner and a concert at elegant Charlottenburg Palace. The scenic Dutch countryside and canals of Amsterdam inspired some of Europe’s most innovative painters. Admire the light and shadows in works by Vermeer, Rembrandt, and other Dutch masters at the renowned Rijksmuseum, or pay tribute to the Father of Modernism at the Van Gogh Museum. Experience an evening of opera in Venice, surrounded by the historical elegance of a 15th-century palace. The singers and musicians of the Musica a Palazzo ensemble perform classics of Italian opera within the ornate salons of Palazzo Barbarigo Minotto. Move from room to room along with the performers and soak up the drama of epics like 'La Traviata' and 'Rigoletto' in a truly intimate environment. Experience the magic of the opera with a performance by one of Italy’s most prestigious conservatoires. Enjoy a thrilling 2.5-hour performance of Giuseppe Verdi’s classic opera ‘La Traviata’, performed by the renowned I Virtuosi dell'Opera di Roma in the spectacular setting of the Salone Margherita Theatre. Dive into the Rome of Dan Brown’s bestselling novel on this ‘Angels and Demons’ tour. Inspired by the book, the tour takes you on a journey through the Eternal City as you search for messages from the secret society known as the Illuminati. Along the way, admire Rome’s beautiful art and attractions like St Peter’s Square, Piazza Navona and Castel Sant’Angelo. This walking tour is limited to 25 people. 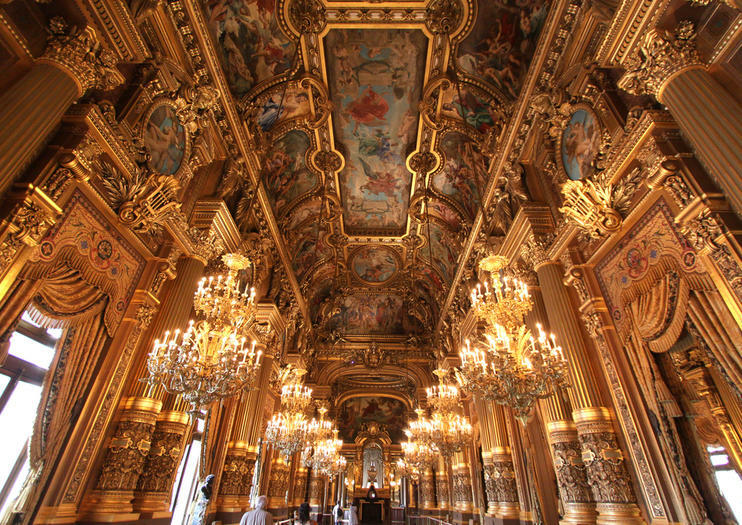 Take an incredible 1.5-hour walking tour of the Palais Garnier, Paris' premier opera house, to see one of largest opera houses in Europe. The Opera Garnier, as it is often called, inspired the setting for the famous musical, 'Phantom of the Opera.' During the tour, your expert guide will show you the Grand Foyer, the sumptuous main staircase (Grand Escalier), the Member's Rotunda and the auditorium itself. Enjoy the opulent Neo-Baroque décor of this beautiful building, designed by French architect Charles Garnier in the late 19th century. Travel through time to Elizabethan London on a guided tour of the Shakespeare’s Globe Theatre. Visit the reconstructed theater on the city’s Bankside and enjoy lively commentary about staging and performance in Shakespeare’s day. Then, head into the Globe Exhibition with an audio guide to listen to recordings of riveting performances and learn about drama in 16th-century London from interactive displays. Make your experience even more memorable by upgrading to include a sumptuous 'A Midsummer Night's Dream'–themed afternoon tea at the Globe's restaurant.